A new Shazam! comic book is making its way to the world of DC Comics. Announced during San Diego Comic-Con, Geoff Johns, who is one of the more prolific and important writers to grace the pages of DC in recent years, is set to pen the new series, with art from Dale Eaglesham. Johns recently stepped down from his role at DC Films, but inked a TV deal with Warner Bros., which has given birth to a Stargirl TV series, which was also just announced. Johns made the announcements during his spotlight panel at SDCC. This marks the second collaboration between Johns and Eaglesham. The two previously worked with one another on a run of Justice Society of America. 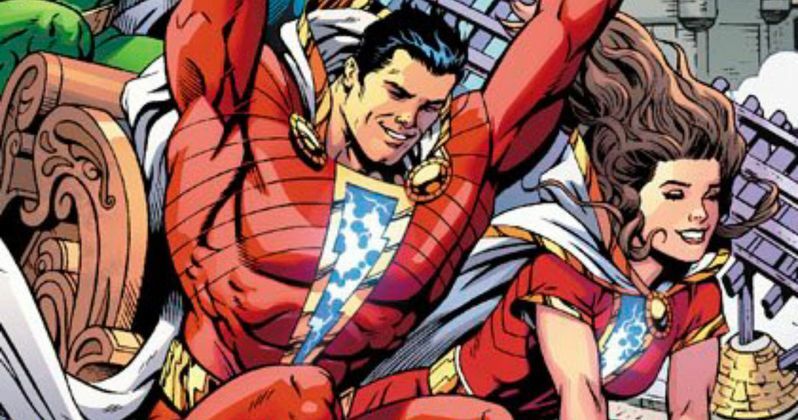 DC confirmed the news on Twitter shortly after the announcement, while also revealed a piece of artwork from the new book, showcasing the "Shazam Family." "It's time to say the magic word again. @geoffjohns and artist @daleeaglesham are bringing back SHAZAM! in a new monthly comic book series, coming this November! #DCSDCC"
The concept of the Shazam Family was introduced by Geoff Johns and Gary Frank during DC's New 52 initiative. This run gave Billy Batson, the young boy who turns into the titular hero by uttering his namesake, and his extended foster family of Mary, Freddie, Eugene, Pedro, and Darla, super powers. The artwork depicts the full group on a roller coaster having themselves a heck of a time. In an interview following his panel, Johns had this to say about the new book. "Gary brings such a wonderful emotional quality to all his work, but especially with Shazam, he captured those kids so well. I only wanted to do the book if I could partner with someone who was going to bring that emotional, whimsical, superhero look to it. It's got to be such a distinct book on the stands. Dale Eaglesham, when we were working together on Justice Society of America, there was an issue where it was just about a pancake breakfast at a firehouse, and that's one of my very favorite issues that we did, because of that emotion. I talked to Dale, we were just talking, and I was telling him about Shazam. He said, 'Oh my God, I'd kill to do that,' so I was like, 'Okay! Let's do it!' That was it. We're really lucky to have him. I can't wait to work with him on this." The news of this new book is conveniently timed. Warner Bros. has wrapped production on a live-action movie centered on the character, which stars Zachary Levi as the DC hero that is set to debut next year. Warner Bros. will be showcasing the Shazam movie over the weekend, which there is currently a lot of buzz building for. Shazam! #1 hits shelves on November 21, just five months before the movie arrives in April 2019. This news was previously reported by The Hollywood Reporter. You can check out the first art from the new book for yourself below.